Nice but tricky plot when Valar is revealed simultaneously. Can anyone please clarify this: Mel (core set) is in play and both of these plots are revealed. is she eligible to come back into play from the dead pile as nothing happened? What is the correct to resolve this? It's down to the order the first player chooses the plots to be revealed in. The Many Powers player will (usually, barring Initiative boosts) win Initiative and choose first player. As long as first player resolves Valar first and everything dies, then Many Powers is resolved, allowing a Holy character to come back from the dead, which can be a Mel that has just been killed by Valar. If Many Powers was chosen to resolve first, the dead character comes back into play, then valar kills everything, including that character. 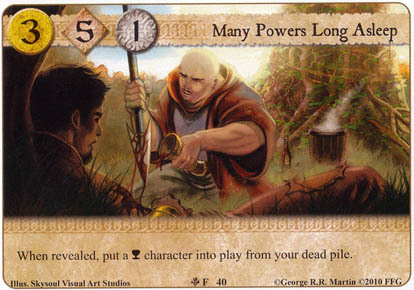 If Valar is chosen first, any characters not saved are Moribund:Dead Pile. They are not physically moved to the Dead Pile until all When Revealed's, Passives and Responses have been resolved. So a character killed with Valar cannot be chosen as a result of the Many Powers When Revealed effect in this scenario. Johny is correct. The timing rules in the FAQ give the full, detailed explanation he summarized. When the two plots are revealed together, you will not be able to put any Holy characters killed by Valar into play with Many Powers... because those dead characters will not have been moved into the dead pile before Many Powers... resolves -- no matter what order the plots go in. Thank you all for the enlightening answers! Sorry, yes. I shouldn't answer questions when tired! Thrones' ridiculous timing structure is such that even though Valar kills all characters in play and has fully resolved before Many Powers kicks in, those characters aren't actually dead till the end of the phase. Roll on Second edition when Moribund is banished where it belongs!